Everything you need to know about Beacon 3D+'s membership plan. Beacon 3D+ users can choose to remain a Basic Beacon 3D+ user or pay for a Beacon 3D+ Membership to receive access to additional discounts and advanced features. Basic users pay per property and there’s no membership fee. Basic users can capture any size property, including multi-family properties. The price per property depends on the complexity of the roof. More than 85% of properties fall within the simple and average bucket, ranging between $20 and $50. 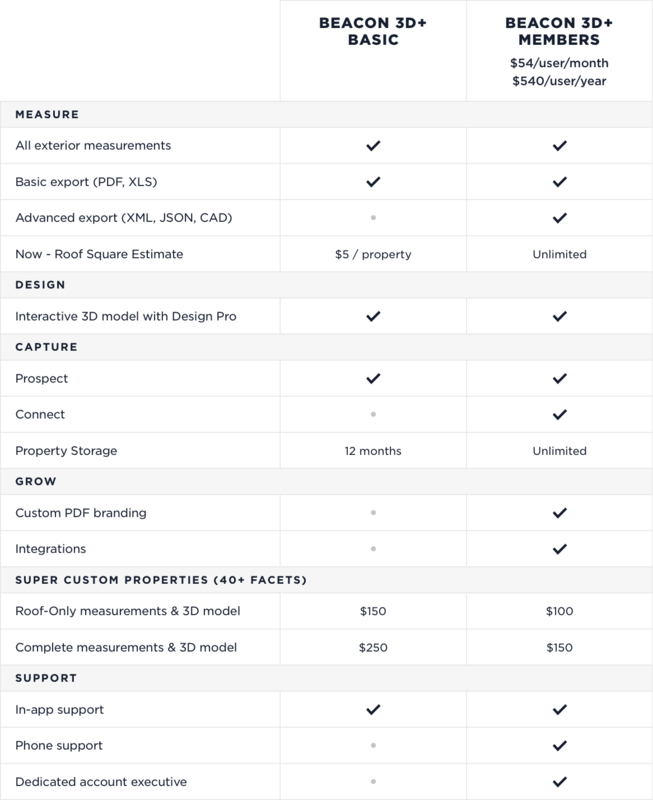 Basic users also have access to quick roof square estimates with the Beacon 3D+ Now feature for the flat rate price of $5 per property. Beacon 3D+ Members pay per property and have access to all the features of a Basic User plus, they receive access to powerful advanced features and substantial discounts with their membership. Membership pricing is $54/user/month or save over $100 per year with our annual plan at $540/user/year. Per property pricing still applies. Feel free to reach out to us at any time at support@hover.to or (844)754-6837– we’ll gladly help.